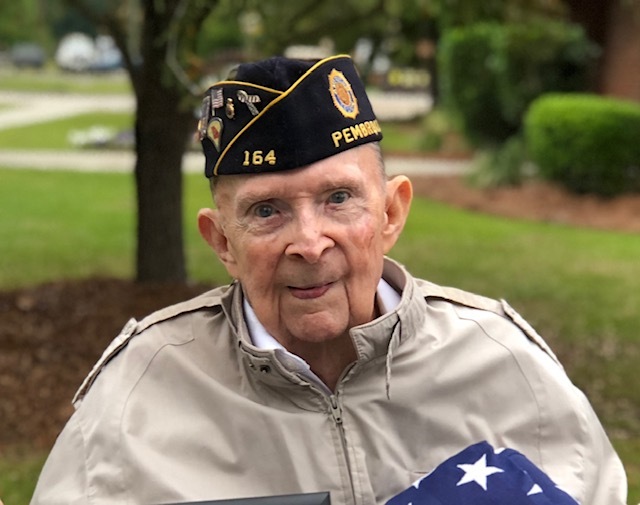 Rex Waters, 95, of Pembroke, passed away peacefully on Wednesday, January 30, 2019 at Ogeechee Area Hospice in Statesboro. He was born in Denmark, Georgia, but as long as he could remember, he lived in Pembroke and dearly loved his hometown. He was a member of Pembroke United Methodist Church, and a continuous member of the American Legion for 71 years. He loved his country, big band music, and his family. He told the greatest stories, and loved to laugh. He joined the Navy during World War II and served in the Pacific Theater aboard the LCT 782 in the battle of Peleliu. The Navy sent him back to the States to Officer Candidate School at Ole Miss in Oxford, Mississippi; however when the war ended he was needed back in Pembroke to take over his father’s sawmill business, thus ending his career in the Navy. After a number of years in the sawmill business, his love of cars, trucks and people led him to a long career in the business of car sales. He enjoyed matching people with a vehicle that suited their taste and needs at Hartzog Chevrolet, Darien Ford, and J. C. Lewis Ford. His customers became his friends and many followed him to whatever dealership he was working for. He still remembered the vehicle each customer bought from him and many of the details of each transaction. He was an avid NASCAR fan. Bill and Chase Elliot were his guys. He later went to work as a Bryan County Court bailiff where he made more life-long friends and reconnected with many old friends. During the last 20 years, he enjoyed his employment and association with his good friend Bill Reed and AAA Bryan Bonding. He finally retired at age 95 in 2018. He had an extensive support team of friends and family who helped him fulfill his wish to remain at home in his final years! (You know who you are!) Each and every one of you will be appreciated for eternity. His family is also forever grateful to each person at Ogeechee Area Hospice. You all are the best caregivers anyone could ever hope for. He was preceded in death by his parents Tom and Elloyce (Quattlebaum) Waters, sisters Catherine Waters and Nan Pennington, and his wife of 68 years Faye Owens Waters. Surviving to cherish his memory are his three daughters and two sons-in-law Gwen (Bill) Sims, Atlanta; Cynthia Odum, Jesup; and Debbie (Rufus) Hendrix, Statesboro; brother, Thomas Waters, Pembroke; sister-in-law, Jewel Owens;five grandchildren: Frank (Dana) Glenn, Charlie Glenn, Rex Odum, Joey (Thad) Harvey, and Jackie (Bobby) Linton; and ten great-grandchildren; numerous special nieces and nephews and his beloved cat Billy Jack. Visitation will be held 1-3 p.m. Saturday, February 2, 2019 at the funeral home. Funeral service will be 3 p.m. Saturday, February 2, 2019 in the chapel of Flanders Morrison Funeral Home with Dr. Thad Harvey officiating. Interment will be in Northside Cemetery with military honors. Pallbearers will be his grandsons and great-grandsons. Flanders Morrison Funeral Home and Crematory is in charge of the arrangements for Mr. Rex Waters.